Citation Information: J Clin Invest. 2017;127(9):3230-3239. https://doi.org/10.1172/JCI90605. Prion diseases are a group of progressive and fatal neurodegenerative disorders characterized by deposition of scrapie prion protein (PrPSc) in the CNS. This deposition is accompanied by neuronal loss, spongiform change, astrogliosis, and conspicuous microglial activation. Here, we argue that microglia play an overall neuroprotective role in prion pathogenesis. Several microglia-related molecules, such as Toll-like receptors (TLRs), the complement system, cytokines, chemokines, inflammatory regulators, and phagocytosis mediators, are involved in prion pathogenesis. However, the molecular mechanisms underlying the microglial response to prion infection are largely unknown. Consequently, we lack a comprehensive understanding of the regulatory network of microglial activation. On the positive side, recent findings suggest that therapeutic strategies modulating microglial activation and function may have merit in prion disease. 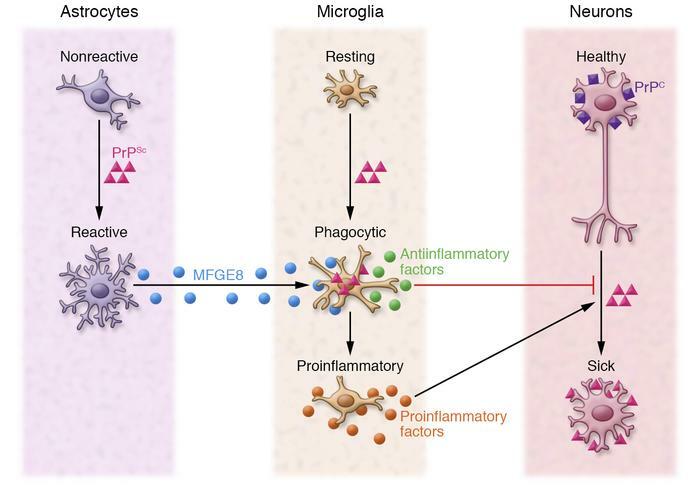 Moreover, studies on the role of microglia in prion disease could deepen our understanding of neuroinflammation in a broad range of neurodegenerative disorders. Microglial activation in prion disease. At an early stage of prion infection and PrPSc aggregation, microglia are activated by PrPSc. Microglia then acquire a phagocytic phenotype and produce several antiinflammatory cytokines such as IL-4, IL-10, and TGF-β. The phagocytosis of prions by microglia is facilitated by the astrocyte-derived opsonin MFGE8. However, over time, the clearance of prion becomes insufficient, and sustained PrPSc accumulation leads to neuronal damage. This damage may trigger microglia to switch to a proinflammatory phenotype with secretion of TNF-α, IL-1β, and IL-6. Such inflammatory cytokines may also convert astrocytes to a deleterious A1 phenotype.